Some days ago, when I downloaded the NC version of VisualWorks, I found also this page, with the possibility of request a CD of VWNC to Cincom. Then, I completed the form and forgot the question. Today, very very few days after such request, I received on my home, on Sunchales, Argentina a box containing a software box, coming from Cincinnati!. And, as in old (good) times, when the software comes from the producers inside nice boxes with manuals. (Even my own modest products of past times (Biochemical Laboratories, ERP, etc) were boxed with printed manuals!. 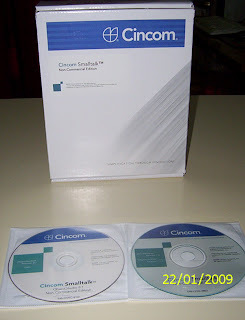 In this case the box have the VisualWorks CD and the ObjectStudio CD (non commercial) versions. Also, one nice datasheet to each product. 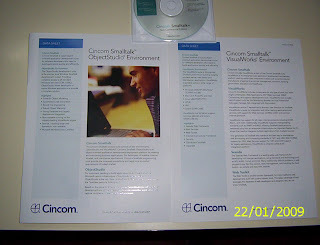 If anyone from Cincom is reading this post I would know if the commercial versions comes with printed manuals, just by curiosity. May be some day, if business permit, I could buy the commercial version. By now I'm very impressed, as I told on my previous post, and I continue learning on my free time (Currently about toolbars, menus and other things of UI building). My current goal is port my Aida/Scribo Console to VisualWorks under the MIT license. Thanks Cincom by sending me the package of NC version! New hosting plans and prices!